Soft, bright green leaves set off contrasting bright purple-red cascading tassels, which can grow to 12 in (30 cm) long or more. ‘Viridis’ (green tails amaranth) is a green cousin with alluring bright green tassels. ‘Fat Spike’ is an easy annual, growing up to 4 feet (1.2 m) high, with mid-green leaves with occasional purple markings. It produces attractive spikes of deep purple-red flowers 3 in (7.5 cm) thick tapering to 1 in (2.5 cm) at the bottom. Amaranthus caudatus grows quickly and easily in well-draining soil that receives full sunshine. 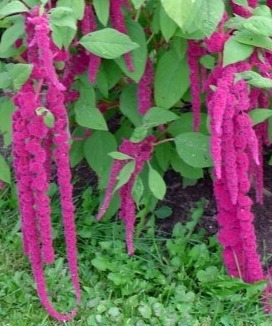 Love-Lies-Bleeding is a fine companion to other annuals. It is attention-getting - even from a distance. Love-Lies-Bleeding is a must have for cut-flower lovers and annual gardeners alike. Bloom Color: Pale Pink, Fuchsia (Red-Purple), Red, Purple, Bright Green. The flowers really stand out in long, slender, utterly prostrate 18- to 24-inch stems. USDA zones: All (when grown as an annual); 10-11 (when grown as a short-lived perennial). The amaranth plant needs exposure to full sun. Sow the seeds around February to March. The seeds needs to be in a temperature of 68-77° F (20-25° C). Sow seed in early spring and plant out after last frost. Germination takes ten to fourteen days. Direct sow the seed after the lost frost. The soil pH requirements are 6.1 to 6.5 (mildly acidic), 6.6 to 7.5 (neutral), and 7.6 to 7.8 (mildly alkaline). Add seed compost and fine vermiculite to the soil. Many growers prefer to sow the seeds on the surface itself. If your preference is to sow indoors, you will want to sow indoors around 6-8 weeks before last spring frost. These plants can be transplanted. Whether you sow them indoors or spread the seeds on the surface itself, you will want to transplant them when they are almost 3 inches in (7.5 cm) in height. You will want to keep the soil damp; however avoid overwatering to prevent disease. 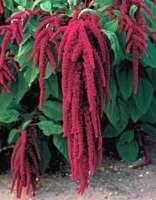 Water Amaranthus caudatus regularly (in the morning if possible); do not let the plant dry out. Fast-growing herbaceous plants require more attention to watering than woody plants. Water slowly and deeply if plants begin to wilt. Watering twice, a few minutes apart, helps water soak in deeper. Mulches help reduce water evaporation in hot or dry weather. Use a soaker hose or drip system to irrigate. Soaker hoses and trickle or "drip" irrigation are very efficient and water-conservative. Tall or leggy plants may be cut or pinched back to stimulate strong new growth. Cut or pinch stems of flowering or foliage plants just above leaves or old leaf joints. Thin excess growth so remaining growth will be more vigorous. "Deadhead" - remove faded flowers or seedheads to stimulate new flowering growth. Remove dead, faded, or diseased foliage as needed. Remove some foliage during transplanting to reduce stress on new roots. Clean up plants at the end of the season to reduce pest or disease buildup and to keep the area neat. Avoid putting diseased plant parts in the compost, or risk spreading diseases later. Problems with root rot, fungal leaf spot, or aphids may occur. Amaranth plants make fine additions to large cut-flower arrangements, either as background color or bold front-and-center accents. Also, these are superb plants for hanging baskets. Have fun combining this rare bloom color with all the whites, yellows, and reds in your garden!